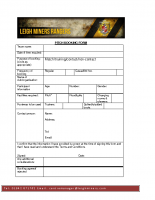 This document represents the hiring agreement between Leigh Miners Welfare Club and the Leigh Miners Rangers rugby section (the club) and the facility hirer (INSERT NAME). Once a booking enquiry has been confirmed between the club and the hirer, the hirer agrees to be bound by the following considerations. (i) All bookings must adhere to the specifications and requirements they have outlined in their original booking. This includes the number of people attending the booking, the nature of the facilities used and the type of activity being carried out at the session. Any deviation from this agreement may result in the booking being terminated, charges being levied or future booking requests being declined. (ii) All bookings are at the discretion of the club, who reserve the right to postpone or cancel bookings should extreme circumstances dictate. Whilst every effort will be made to honour the booking, extreme circumstances for example a sudden and significant decline in weather conditions rendering the pitch unusable, may from time to time arise and in these circumstances the club has finally say on whether the booking can proceed. (iii) The club is happy for users to have access to all facilities and equipment such as post protectors, marker flags etc on site which will support and enhance their booking however we would ask that the hirer take every possible measure to ensure facilities are left in the condition in which they were found, including dressing rooms and shower areas. If support is required in carrying out any cleaning and tidying and return and storage of equipment after the event then we would request the hirer notify the club before the booking proceeds. (iv) Any damage to or loss of equipment and / or facilities resulting from the booking event will be the liability of the hirer. (v) The club reserves the right to levy a charge on certain types of hire. Whilst we will endeavour to accommodate bookings free of charge where possible, in certain circumstances for example commercial bookings, events where spectators are charged an entry fee and events requiring additional facilities such as floodlighting, the club will require further dialogue with the hirer to determine any hire charge or other considerations needing to be taken into account.